Catered ski chalet vs. self-catering apartment – which suits you best? One of the most frequent questions we are asked is, “Should I book a catered ski chalet or go self-catered?” In all honesty, it’s a really good question. Obviously the needs of the group tend to dictate the most suitable ski holiday for you, but unless you have experienced both a catered ski chalet holiday AND a self-catered ski holiday, you may not know which you would enjoy the most. I therefore thought it would be a useful exercise to examine both types of holiday and look at not only the pros and cons of each but also look specifically at WHO might enjoy them the most. A much more relaxing, easy holiday as everything is done for you. No cleaning or cooking! Those looking for a ‘proper’ holiday. A holiday should be as relaxing as possible, and you aren’t truly relaxing if you are cooking and cleaning. Let the chalet staff cook you breakfast, afternoon tea as well as a 3-course evening meal. They will also clean your rooms daily. Any group looking for a very high standard of accommodation. Whilst self-catered apartments are getting better and better, there are very few indeed that can rival the top-end catered ski chalets for pure luxury. If you are used to your creature comforts and want something special, a catered chalet is really the only choice. Social skiers and boarders. Booking a few rooms in a larger catered chalet is a great way to meet other like-minded individuals. Many chalet-mates end up staying in touch and going on holidays together in the following seasons. This works especially well if you pick a resort which best reflects what you are looking for out of a holiday. 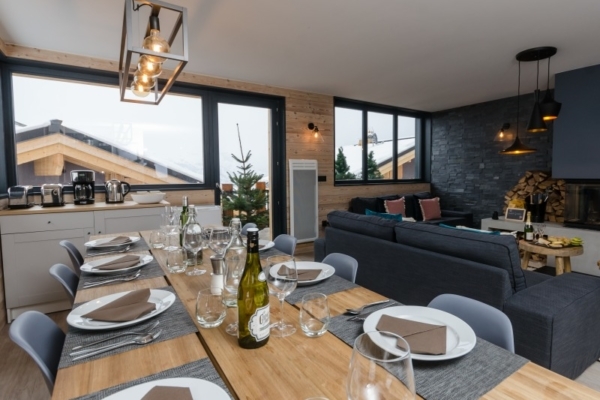 For example, if you are looking for a quiet, relaxing holiday just chilling in the chalet and not going out, going to St. Anton would more likely provide you with other guests that enjoy a drink or five after dinner. Taking rooms in a chalet in La Rosiere however, will more likely give you the sort of guests sharing your priorities. The ‘Foodie’ group. Skiers and boarders that treat dinner as the main event and prefer going out to sample the resort restaurants. Resorts such as Zermatt and Courchevel are fantastic for this. Catered ski chalets that cater to this market do exist but they tend to be towards the upper end of the market. All about the après. Whilst many groups that fit this bill do end up booking catered chalets, it can be a waste of money as so many dinners will go uneaten whilst you are dancing on the tables in the Mooserwirt. It is also a real trial for the chalet host who will spend most evenings watching his 3-course meal overcook whilst tutting and looking at his watch. If you are in an apartment and looking after your own food, this becomes a non-problem. Shoestring skiers. If you are disciplined and do a big shop before the mountain, it is undoubtedly a cheaper holiday. Especially if you drive down and share the petrol and toll fares. It should be doable (non-peak) for under £250 a head. Just be prepared to live on pasta and sauce or meals out of tins. Luckily the French tinned food can actually be very impressive! Small groups looking for their own place. Smaller catered ski chalets do exist, but for a group of four there are only a handful of examples. If you prefer not to share accommodation and there are four of you, chances are it will be in a self-catered apartment. If you like are looking for a catered ski chalet for your next group ski holiday, contact us and let’s have a chat!